Home > News & Events > News Releases > What can we learn from a comparison of FDA and EMA approvals for oncology PRO labeling? The US Food and Drug Administration (FDA) and the European Medicines Agency (EMA) use different evidentiary standards to assess patient-reported outcome (PRO) data from oncology studies. 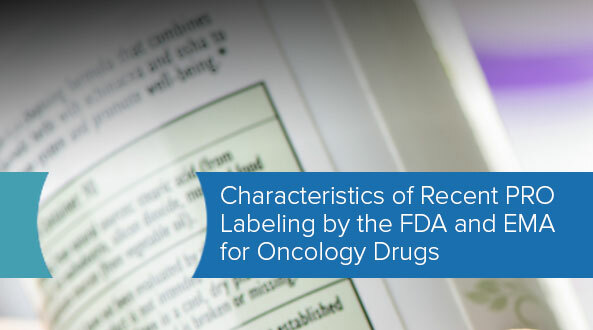 In recent years, the FDA has granted PRO labeling to very few oncology drugs. PRO labeling by the EMA was frequently based on open-label studies, on broad concepts such as health-related quality of life, and on PRO measures that may be outdated and unsuitable for contemporary oncology clinical trials. Research just published in Value in Health compares FDA and EMA labeling for evidence based on patient-reported outcomes (PROs) of new oncology treatments approved by both agencies. Oncology drugs and indications approved between 2012 and 2016 by both the FDA and the EMA were identified. PRO-related language and analysis reported in US product labels and drug approval packages and EMA summaries of product characteristics were compared for each indication. These comparisons can help in understanding evidentiary standards differences and may be useful in guiding PRO measurement strategies for study sponsors pursuing PRO labeling. Sponsors pursuing labeling from both agencies should include PRO measures that assess patient-focused proximal concepts of core disease symptoms, treatment-related symptoms, and impacts on physical functioning in clinical trials. The addition of health-related quality-of-life assessments may also be useful for EMA reviews. A review of patient-reported outcomes labeling for oncology drugs approved by the FDA and the EMA (2012-2016). Gnanasakthy A, Barrett A, Evans E, D'Alessio D, Romano (DeMuro) C. Value in Health Regional Issues. 2019 Feb;22(2):203-9.